A late try by Noa Nakaitaci gave France a hard-earned victory over Scotland in the Stade de France as both teams completed their preparations for the Rugby World Cup. Scotland had seemed on course for a third successive warm-up victory when Tommy Seymour dashed over in the second half. But, after a courageous defensive stand by the Scots on their own goalline, Nakaitaci finally found a way through while David Denton sat on the sidelines having been yellow-carded. Scotland arrived in Paris hoping to iron out any last-minute kinks in their warm-up match against France before they kick-off their World Cup campaign against Japan in Gloucester on September 23. However, the spotlight focused on New Zealand-born flanker John Hardie was a little more intense than those trained on the rest of the Dark Blues line-up following his controversial call-up. The Kiwi's inclusion in Vern Cotter's 31-man squad at the expense of John Barclay and Blair Cowan, just five weeks after touching down in Scotland for the first time, was branded a "disgrace" and the 27-year-old was under pressure to justify his inclusion. 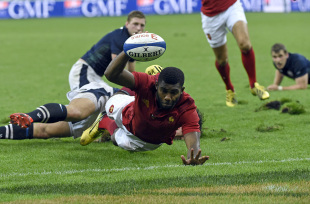 The Scots started 2015 with six straight defeats, but after finally injecting some much-needed momentum into their tournament preparations with back-to-back wins over Italy, they were keen to keep the feel-good factor rolling against Les Bleus. However, a head knock to prop Al Dickinson forced the visitors into an early rethink as Gordon Reid was thrown on after just six minutes. Skipper Greig Laidlaw put the first points on the board soon after as he nailed a 45-metre penalty, but a succession of handling errors was not what Cotter wanted to see with the Japan match just three weeks off. A bulldozing run from Mathieu Bastareaud then set up Frederic Michalak to tie things up with a penalty. The Scots were back in front swiftly though as Laidlaw did well to ignore a hooter blaring out from the crowd and knock over another solid kick. Ross Ford's line-outs had been erratic but the scrum was working well for Cotter's side. However, the French centre pairing of Fofana and Bastareaud were proving to be a right handful with their surging carries. It took fair means and foul to keep them at bay and Michalak ensured France were not hard done by as the Toulon fly-half slotted over his second kick. It looked as though the muscle-bound pair had cut Scotland open again five minutes before the break but referee Wayne Barnes spotted Bastareaud's forward pass before Fofana dotted down in the corner. To Cotter's relief, Fofana limped off soon after. Another Laidlaw penalty after French skipper Pascal Pape was penalised at the breakdown gave the Scots the half-time lead. But the away side could not keep their discipline as the second half got under way and Michalak once again tied things up with another penalty. It could have got worse for Scotland had Sean Maitland's try-stopping tackle on Yoann Huget not put the galloping wing into touch, after Matt Scott lost possession. That let-off was followed by another swing in momentum as the Scots charged forward - but Finn Russell and Mark Bennett failed to finish off a daring break as once again the visitors failed to make the simplest of exchange stick. But Scottish enthusiasm was dented as the hosts took the lead for the first time when long-range specialist Scott Spedding squeezed a penalty over from inside his own half. 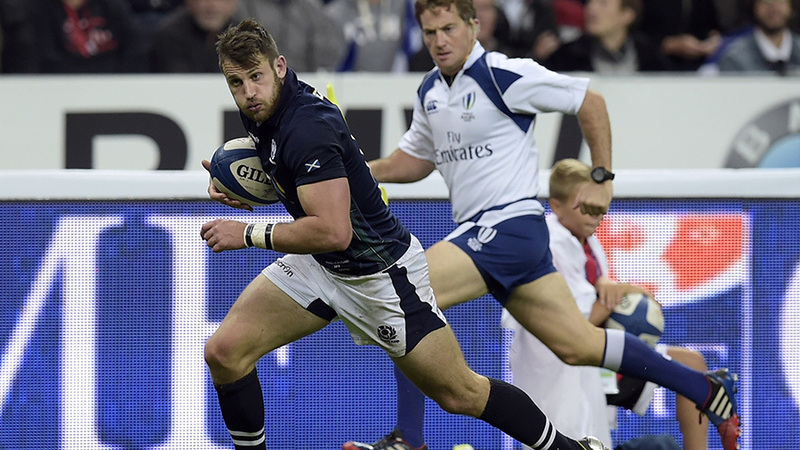 However, Laidlaw then came up with a stunning sucker punch as the Scots stormed back in front after 62 minutes. Spotting a gaping hole on the left-hand side of the Les Bleus defence, the scrum-half fired a perfect kick over the top and watched with joy as Tommy Seymour beat Spedding to the ball after using his soccer skills to good effect as he dribbled round the full-back's tackle, leaving him to jog in for the score. Laidlaw added the extras. However, the French were in no mood to lie down and poured forward. The pressure was too much for David Denton, who left Scotland a man down for the final 10 minutes when he was sin-binned for a cynical foul on Bastareaud. And with the extra man, Saint-Andre's men could not be stopped as Nakaitaci combined passes with Remi Tales before storming over for the winner, converted by substitute Morgan Parra.